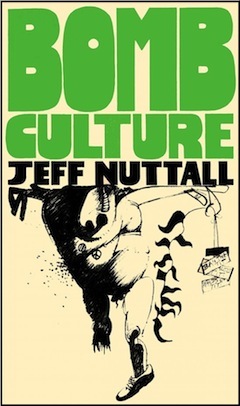 When I ​first ​read ​Jeff Nuttall’s Bomb Culture, I ​saw ​the title ​two​ ways​ — descriptive ​and​ prescriptive — “bomb culture” (the​ kind that made nuclear annihilation possible​) and “bomb the culture”​ ​(a​ call for revolution​​). ​A half-century later I still see it that way.​ Far from being bound by its time, Nuttall’s 1968 investigation of Britain’s underground political and literary protest culture was a prophetic critique, and applicable as well to the American scene. The need to contextualize Nuttall’s landmark book is almost as astonishing as the fact that it has been out of print for 50 years. The main thesis of Bomb Culture seems to me as current as ever. Certainly, it would be hard to dispute. 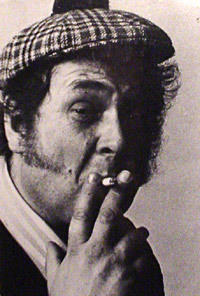 Per the editors: “Nuttall argued that a tangible psychic dread of nuclear holocaust pervaded both high and low cultures, determining their attitude and content, much as the horrors of World War I had nourished the tactics and aesthetics of Dadaism.” Furthermore, given Nuttall’s radical polymathic brilliance — he was a painter, poet, actor, and sculptor, a performance artist, pioneer of “happenings,” jazz trumpeter, cultural critic, mimeo-magazine editor, and the author of nearly 40 books — it is even more astonishing that Nuttall himself is so little known. Let’s hope the republication of Bomb Culture helps to remedy that. It will be tough in today’s environment. In 21st-century Britain, on the other hand, the art of rebellion has been so thoroughly institutionalized that no real dissident art is possible. Instead we have a constellation of cultural stars who shock without shocking anyone, mock authority that gave up the ghost long ago, and delight a generation of avant-garde grandparents. We have gone from Joe Orton to Grayson Perry. The cultural change that started with the fame of Damien Hirst in the early 1990s has turned punk dissidence into mainstream culture. The transformation is so liberal, so encompassing, that it excludes no one and distresses no one. Like coalition politics, it squares every circle. But far from liberating us to enjoy the wonders of our avant-garde age, this universal modernism is just sinking British culture into mediocrity. Britain was more exciting when it was more dull. … [It] was flat and grey and provoked colorful resistance. Now the greyness has been glassed over, and modern British culture seems oddly pointless.